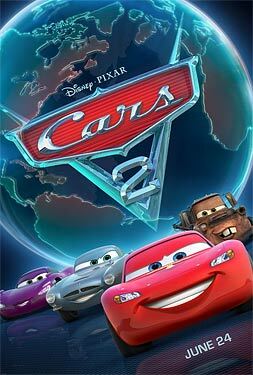 Pixar Animation Studios and Walt Disney Studios are off to the races in “CARS 2” as star racecar driver Lightning McQueen (voice of Owen Wilson) and his best friend, the incomparable tow truck Mater (voice of Larry the Cable Guy), jump-start a new adventure overseas where Lightning is competing in the World Grand Prix. But the road to the finish line is filled with plenty of potholes, detours and bombshells when Mater is mistaken for an American spy and finds himself embroiled in a top-secret mission orchestrated by a very sporty British car (voiced by two-time Academy Award winner Michael Caine) and his new partner Holly Shiftwell, a stunning rookie pink sports car voiced by Emily Mortimer. The fast-paced fun includes a colorful new cast of cars, boats, trains and airplanes – complete with menacing villains and international racing competitors – presented in Disney Digital 3D.